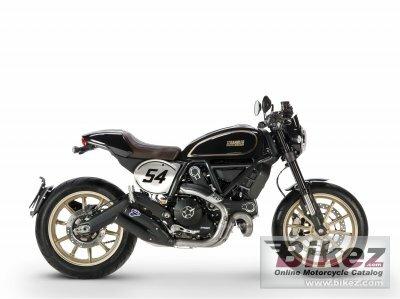 2018 Ducati Scrambler Cafe Racer. Picture credits - Ducati. Submit more pictures. The typical Scrambler teardrop tank with interchangeable panels is combined with a new seat, specially designed and equipped with a seat cover for the passenger. The handlebars with mirrors attached to the ends are typical of 60s racing; the same goes for the Termignoni exhaust with double silencer, the headlight fairing, the side number holders and the new Pirelli Diablo and #153; Rosso II with 17�� aluminium wheels. Ask questions Join the 18 Ducati Scrambler Cafe Racer discussion group or the general Ducati discussion group. Bikez has discussion forums for every bike. View comments, questions and answers at the 2018 Ducati Scrambler Cafe Racer discussion group. You can sign up for e-mail notifications when other riders answer you. If you have extensive experience with the MC, please send us a review. If you consider buying this bike, you should view the list of related motorbikes Look at photos. Compare technical specs. And check out the rating of the bike's engine performance, reliability, repair costs, etc. You can compare the rating with other bikes.